In July, the Chicago Public Library, in cooperation with the Emilio del Rosario Foundation, will host a piano recital featuring an extremely talented young musician. Also, the Library welcomes cast members from Million Dollar Quartet for a performance and Q&A session. Also featured are new exhibits displaying curious items in a whimsical and remarkable way, as well as an interesting artist discussion. 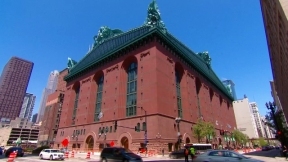 All events take place at the Harold Washington Library Center, 400 S. State St. For more information, visit chicagopubliclibrary.org. In cooperation with the Emilio del Rosario Foundation, join us for a piano recital by 4th grader Frank Gao, performing a solo piano recital of the works of Beethoven, Ravel and Chopin. Friday, July 11 at 12:15 p.m. Cast members from Million Dollar Quartet, Chicago’s longest-running Broadway musical currently running at the Apollo Theater, appear at the Library for a special mini-performance and post-performance conversation. For more information, visit chicagopubliclibrary.org or call the Chicago Public Library at (312) 747-4050.